← What Effect Would Stopping the Flow Have on Ironman? As summarized in a prior post, we are now collecting air pollution data at the site of the proposed marine garbage transfer station (MTS) at East 91st Street in Manhattan. The site is next to Asphalt Green, a large community center used by thousands of children for outdoor recreation. Below is the initial three weeks of data, and we will continue to collect data on the atmospheric fine particulate concentration (PM2.5) so we can see how it changes if the MTS is built and begins operations. 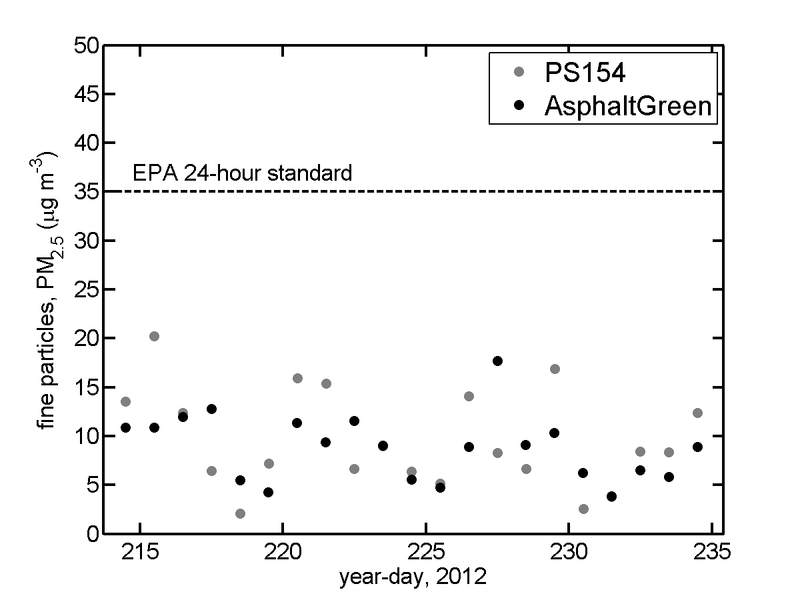 Daily average concentrations of atmospheric fine particles in micrograms per cubic meter at Asphalt Green, from August 2-23, 2012. Data from a school in South Bronx (PS154) are shown for comparison. Concentrations at both sites did not exceed the EPA standard for a 24-hour average. One primary question with the MTS is whether or not it makes air pollution worse, and these baseline data will help address that question. If air quality significantly worsens, the data can be used to help push the city or state DEC to change operations at the MTS. Broader datasets of air quality including ozone and other constituents can be viewed and even downloaded from the NY State DEC. The Aero-212 sensor we are using is not as high-quality (expensive) as the ones used by the DEC, but the figure above shows a good correlation between two nearby (a few miles apart) stations. The future goal is to get the data online in real-time for the public, perhaps as part of our Urban Ocean Observatory website. This entry was posted in air pollution and tagged air quality, Asphalt Green, children, exposure, garbage, Manhattan, marine, measurement, MTS, observation, particle, particulate, PM2.5, pollution, transfer, Upper East Side, Yorkville. Bookmark the permalink.